Can be used with our A-13310-USA turn signal kit and our super bright A-13465-LED bulbs. 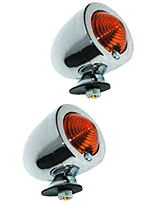 Set of 2 Indicator lamps with chrome metal body and short stem. 12v 23w bulbs are fitted. Size: 2.5" long (including lens), 1 3/4" diameter. Set of 2 Indicator lamps with matt black metal body and short stem. 12v 23w bulbs are fitted. Indicator flasher unit for 6v systems. You need this when adding indicators to your model A. Indicator flasher unit for 12 volt negetive earth. Positive Earth electronic 6V flasher unit. 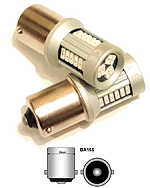 In some cases when you are running LED lindicator lamps, you don't create enough resistance to trip thermal flashers. This electronic flasher will overcome that problem. Also has a built in click! In some cases when you are running LED lamps, you don't create enough resistance to trip thermal flashers. This electronic flasher will overcome that problem. Also has a built in beeper! Flasher Unit Mounting Clip for the above flasher units. We have these covered with vinyl shrink rap, to make a firmer fixing. Usually mounted behind the kick panel on a Model A Ford. You can add this to any column mounted lever style turn signal kit. The beeper gets wired into the flasher to alert you when your lever is activated. Beeps as the unit flashes so you don't forget to turn your signals off. Works on 6 or 12 volt. 6v positive earth LED indicator lamp. These LED lights mounts between the upper and lower bumper bars using your bumper clamp bolt so no extra holes or creative mounting are required. They are much brighter than standard directional lamps and these 6-volt lamps have an integrated resistor so they will usually work with a standard thermal flasher unit, although you may need an extra warning light in the system, to put enough load. 12v negative earth LED indicator lamp. These LED lights mounts between the upper and lower bumper bars using your bumper clamp bolt so no extra holes or creative mounting are required. 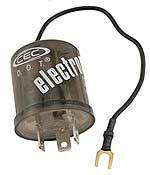 To use these 12 Volt lamps, you will probably need our electronic flasher unit A-13311-12X. When running LED style lighting, getting enough resistance to trip thermal flashers can be a problem. This resistor will create the resistance required for tripping thermal flashers. Come with instructions for wiring into your LED lights works on both 6 and 12 volt systems. 50 watt 6 ohm. One resistor is required for each LED.